Most of us know how to use a dishwasher, or at least know how they're meant to be used. You load up your dirty dishes, pour in some detergent and let it run. Simple, right? But what if there's more to it? Dishwashers are actually fairly underutilized when it comes to household appliances. People assume they have just one purpose when they're actually capable of much more. (Spoiler alert: You can cook in a dishwasher!) 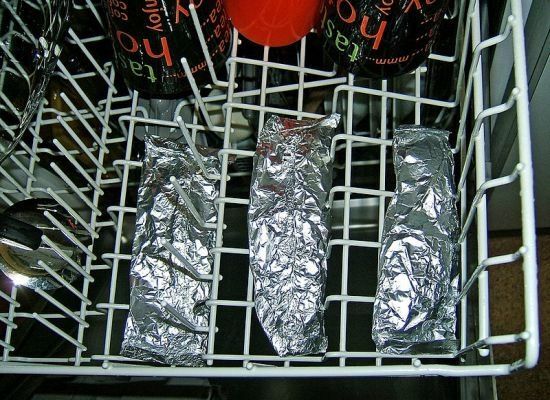 Check out these hacks for additional ways to use your dishwasher. But first, make sure it's clean enough to use. 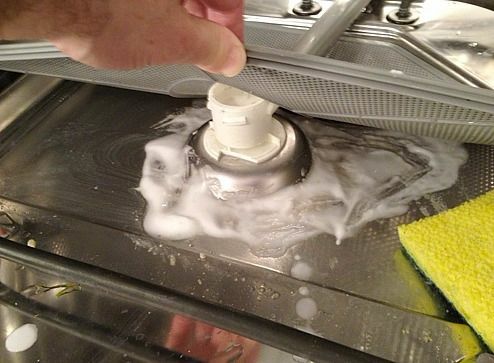 Before you can do too much with your dishwasher, you need to make sure it's clean. That's right, you have to clean something that's only purpose is to clean other things. While there are several ways to quickly clean individual parts of your dishwasher, following these steps will ensure that every inch of your dishwasher sparkles and is ready for the next load. Even after you've cleaned your dishwasher, you might notice that it's still leaving some gunk on your dishes. If that occurs, your best option is the remove the spray arms and clean them and the surface underneath. 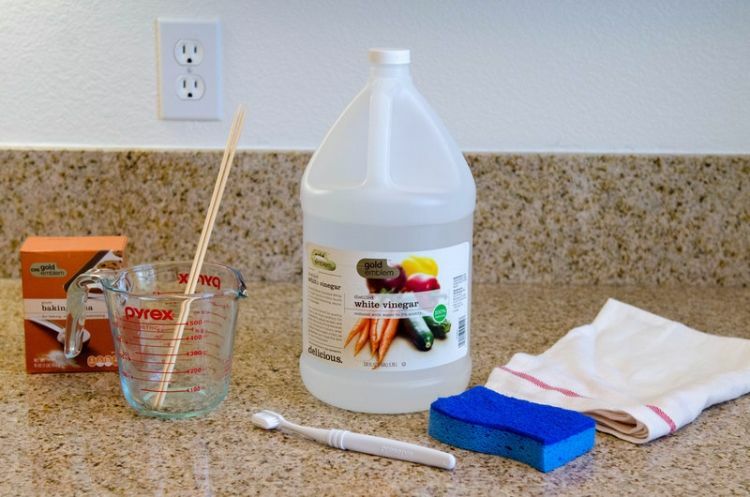 While this does take some time, it will help make sure that every cycle produces clean dishes. To try this, just follow these steps. Detergent tabs can be found in any store across the country, but sometimes you run out before you have the chance to get to the store. You could use this as an excuse to not run the dishwasher for a night, or you could make your own detergent. 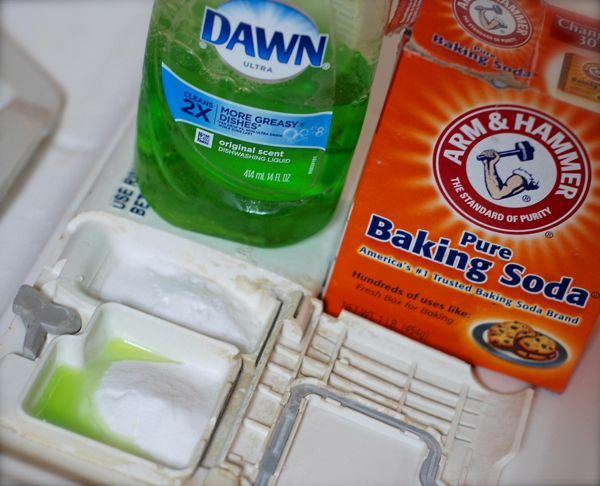 Just pour 2 tablespoons baking soda and 1 teaspoon liquid dish soap into your detergent dispenser and you're good to go. If you prefer the solidity of tabs to the liquid option above, you can make your own dishwasher tabs using almost the same ingredients (with the addition of citric acid) and spending a bit more time on the process. 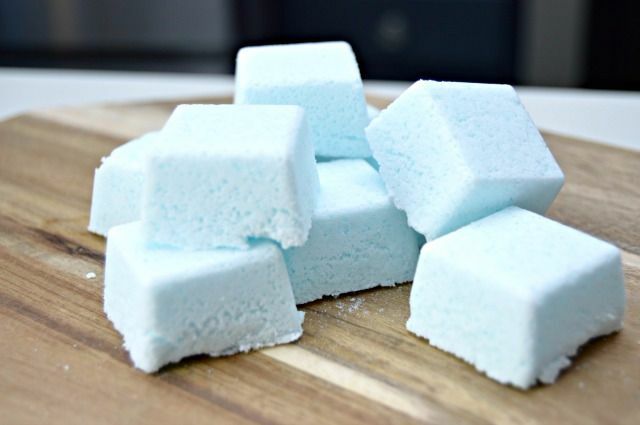 For the "recipe" for these homemade dishwasher tabs, check out this Mom 4 Real page. 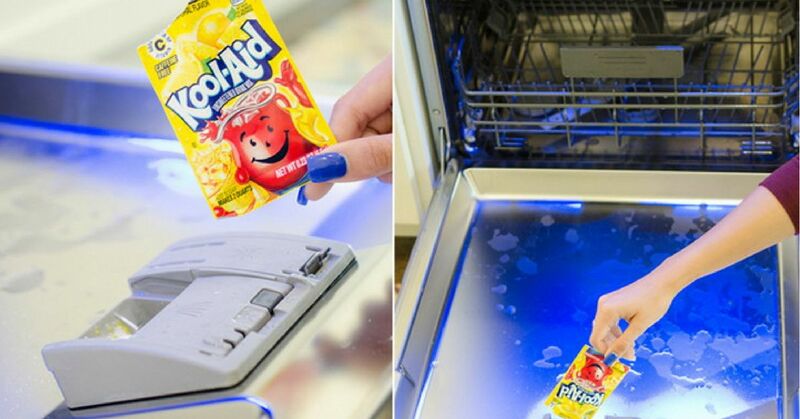 When you think of Kool-Aid, you probably think of drinking a glass of it on a hot day. But you should also consider using it as a cleaning agent if you need to give your dishwasher a quick clean between uses. 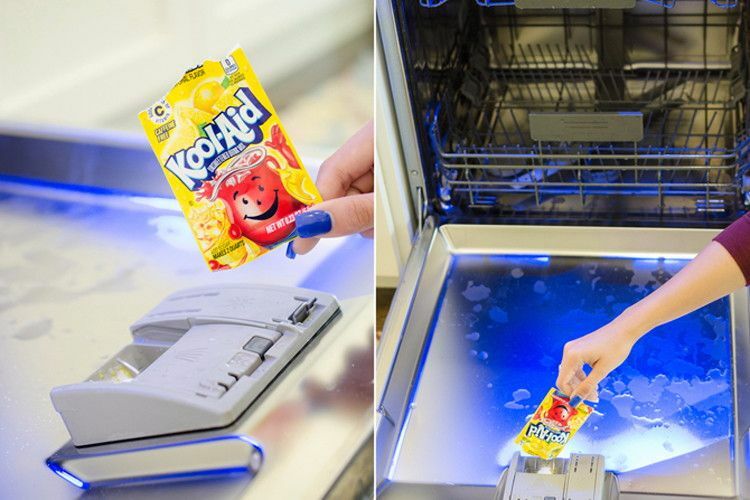 Just pour a packet of lemon Kool-Aid (this is the only flavor you can use for this) into your detergent dispenser and run your dishwasher for a cycle. The citric acid will help break down and remove stains. 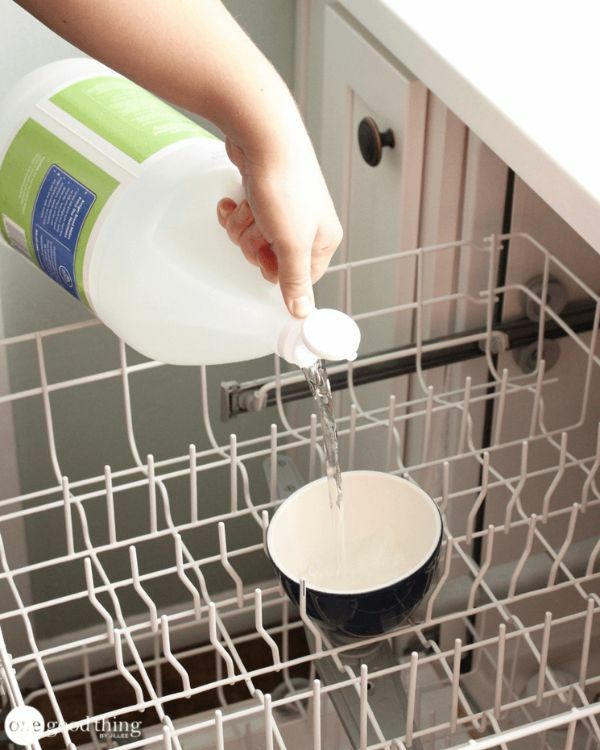 This quick cleaning hack for your dishwasher should come as no surprise. Let's face it, vinegar can clean just about anything. To use it in your dishwasher, fill a dishwasher-safe cup or bowl with vinegar and run the wash cycle. This will help loosen any gunk stuck to the inside of your machine. Even though it's called a dishwasher, you can actually use this appliance for several other things. You can load it up with cleaning supplies, shoes, sports equipment, and even toys. Run your machine for a cycle and your possessions will look brand new. If you have a desktop computer, you've probably noticed that your keyboard is starting to get a little gross. You try to keep it clean, but gunk gets in between the keys and it's impossible to get it out. 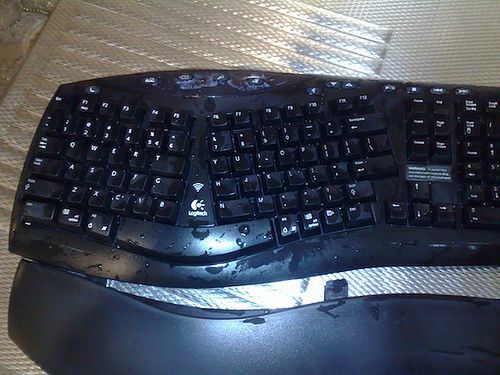 Or maybe you had a cup sitting a little too close and ended up with your keyboard drenched in juice or soda. Well, as impractical as it may seem, you can actually put your keyboard in the dishwasher (make sure you unplug it first). Before you try this, though, be sure to check out all of the steps to ensure that you don't accidentally ruin your keyboard. Hear me out on this one. It is possible to cook salmon in your dishwasher. I'm not 100% sure why you'd want to do this, but hey, no judgement here. You do what you gotta do. If this seems like something you'd be interested in, check out the recipe here. If you're going to go ahead and cook your fish in the dishwasher, you might as well make some potatoes, too. 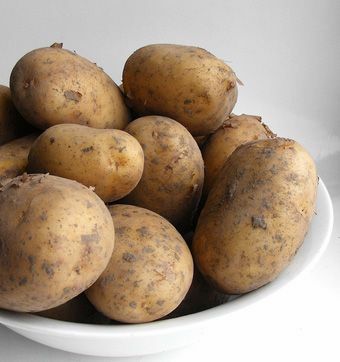 While you can't cook your potatoes in the dishwasher, you can put them in there, run the rinse cycle and save yourself some time cleaning your potatoes. With this list as your guide, you'll have a clean dishwasher in no time. And then you can use it for all of those other things. But first, make sure you share this list with your friends on Facebook so they, too, can unleash the full potential of their dishwashers!